Coming up we’ll hear a fantastic interview with Paul-Martin Foss of The Carl Menger Center for the Study of Money and Banking and former legislative assistant for Congressman Ron Paul. Paul-Martin shares his firsthand account of what those on Capitol Hill truly think of our monetary system, and how most in Congress simply don’t have a clue about the Federal Reserve banking cartel, let alone the importance of sound money. You simply won’t want to miss my interview with Paul-Martin Foss, coming up after this week’s market update. Well it’s been another eventful week in the precious metals markets as silver and the platinum group metals all pushed to new highs for the year, while gold commenced trading on a new platform in China. On Tuesday, the Shanghai Gold Exchange launched a new gold benchmark denominated in Chinese yuan. The new Shanghai gold fix will give Chinese consumers and producers greater ability to conduct large transactions while bypassing the U.S. dollar. Over time, Shanghai may challenge New York and London as the epicenter of the gold trade. At the very least, China seems likely to grow its influence in the Asia region as gold transactions denominated in yuan grow. This increased gold trading activity in Asia reflects the ongoing flow of physical gold bullion out of Western vaults and into vaults in Asia. Asians generally hold gold in higher regard than much of the Western World -- valuing its asset protection and wealth accumulation qualities. And gold goes where it is most adored. China is already the dominant player in the market for physical gold. It consumed an estimated 986 tonnes of the yellow metal last year, beating out India as the world’s biggest gold buyer. China is also the world’s biggest producer. However, Chinese mines are only able to produce about half of what China now uses on an annual basis. In order to make up the deficit, China must import massive quantities of metal. As I alluded to a moment ago, gold is flowing from Canada, the United States, and elsewhere in the West into China and the East. If Chinese demand keeps growing, then at some point there simply won’t be enough physical gold left to satisfy it. Not at present prices, anyway. Checking in with this week’s price action in the gold market, gold got a pretty good bounce Tuesday but no follow through Wednesday or Thursday. Spot gold now comes in at $1,243 an ounce, good for a weekly gain of 0.6%. Bigger moves came in the silver market, which surged for the second straight week to close Thursday a few cents above the $17.00 level. As of this Friday, silver trades at $17.26 an ounce, up a dollar on the week or 6.1%, which is ten times gold’s percentage gain for the week. The platinum group metals are also coming on strong. Platinum is up 4.3% this week to trade at $1,030 an ounce. Palladium shows a whopping 8.4% weekly gain to trade at $618. Well, the big news out of Washington DC is that Treasury Secretary Jack Lew intends to give the 20 dollar bill a major makeover. Last year, the Obama-appointed bureaucrat had promoted the idea of replacing Alexander Hamilton on the 10 dollar bill with a notable woman in American history. But a political consensus grew around the idea of demoting Andrew Jackson off the $20 instead. On Wednesday, Secretary Lew announced that Harriet Tubman’s portrait would replace Andrew Jackson’s on the front of the 20 dollar bill. Ironically, Andrew Jackson was the founder of the Democrat Party in the early 19th Century – and Harriet Tubman was a pro-gun Republican. So this week’s announcement by the Obama administration has a few conservatives chuckling. But Jack Lew’s change didn’t stop there. Even though Hamilton is staying on the front of the $10, the back of the bill is now slated to feature several leaders of the women’s suffrage movement. Secretary Lew also aimed his Diversity bazooka at the $5 bill. He wants to add Eleanor Roosevelt, Martin Luther King, and Marian Anderson to the currency note that now honors Abraham Lincoln. Making our money more politically correct might help Obama administration officials feel good about themselves. But it won’t help the currency retain value. One could also look at this revisionist erasure of President Andrew Jackson and say it represents a symbolic stab at sound money principles. After all, it was Jackson who fought to shut down the Second Bank of the United States, which was the precursor to the Federal Reserve. Jackson preferred gold and silver money over banknotes. He once denounced a powerful delegation of bankers as a “den of vipers.” He wanted to completely separate government finances from banking and credit. To that end, he saw to it that the national debt was completely paid down in 1835. He left office with essentially zero debt on the government’s books. And he was the last President to do so. This is mostly likely the reason Treasury Secretary Jack Lew wants to boot Old Hickory off the face of the $20. Lew has repeatedly threatened Congress with dire consequences for not raising the debt ceiling. And Congress has repeatedly caved in – with the result being that today America is officially in debt by more than $19.2 trillion. Check out the $20 Liberty Gold Coin here. There is no realistic way to pay it all down. Not in any of our lifetimes. The Treasury Department’s plan is to keep us all in perpetual debt slavery, working our whole lives to pay taxes that go to pay interest to bankers. It’s what Andrew Jackson and Thomas Jefferson and George Washington all feared. And it’s why they advocated silver and gold backed money. Well now for more on the topic of sound monetary policy and how Washington DC is sadly now run by a group who has seemingly no clue about what that even means, let’s get right to this week’s exclusive interview. Mike Gleason:It is my privilege now to welcome in Paul-Martin Foss, founder and president of The Carl Menger Center for the Study of Money and Banking, an organization whose mission is to educate the American people on the importance of sound monetary policy. Prior to starting The Carl Menger Center, Paul-Martin worked on Capitol Hill for seven years, including a six year stint with none other than Congressman Ron Paul. As Paul's legislative assistant, he worked closely with Dr. Paul on his Audit the Fed and End the Fed bills. Paul-Martin has a Master's degree from both the London School of Economics and Georgetown University, and has dedicated much of his professional life to the cause of sound money and the values of Austrian economics. So it's a real pleasure to have him on with us today. Paul-Martin, thanks so much for joining us and welcome. Paul-Martin Foss: Well, thank you very much for having me on. Mike Gleason: Well, I guess we'll start at the beginning here, and I'll ask you to explain why you've made it a goal and a mission to spread the ideals of sound money and sound banking. So first off, what does sound money and sound banking mean, and why should the average American citizen even concern themselves with these causes in the first place? Paul-Martin Foss: Sound money basically is money that the government cannot debase and devalue. It's money that allows civilization and commerce to flourish. It protects savers. It protects consumers. It allows individuals to save and invest and plan for the future. What we're seeing is for the past century since the Federal Reserve was created is basically unsound money. It's money that is constantly being devalued. It favors debtors, especially the biggest debtor of all, the Federal government. It's silently taking money out of the pockets of savers and the average individual and putting that money in the pockets of Wall Street. The average American person doesn't really understand or see... who was it, I think Keynes quotes Lenin as saying that “the surest way to debase a civilization is to debase its currency.” This is basically what's happening in our country today, so I'm trying to make it an important issue and make people realize just how important sound money and sound banking is in the United States. Mike Gleason: Furthering the point here, you wrote a great article last week about how the government essentially funds itself through three methods, taxation, borrowing, and inflation, and you explained how sound money is essential to keeping spending in check. Talk more about that, and then also explain more about the role that gold and silver can serve to rein in government spending. Paul-Martin Foss: Yeah, it's like you said, you have taxation, you have borrowing, and you have inflation. Those are the three methods that the government can use to fund itself. Taxation is kind of self-limiting because once you get the tax rates high enough, people are going to stop paying taxes and the government's not going to take in as much money. Borrowing, eventually people… if you are spendthrift and not paying back your debts, they're going to stop lending you money or they're going to lend you money at higher interest rates, so there's kind of a self-limiting factor there too. So inflation ends up being their preferred method of funding themselves, again because it's very subtle. The Fed says 2% inflation rate every year, that's their definition of stable prices. Well, that's devaluing government debt by 2% every year. Over the course of a decade, you devalue your debt by 25%, and you can pay back your debts in devalued dollars, so it's a win-win for the government all around, basically spending a lot more money than it actually has. Gold and silver have always been great checks against the government because there's just a limited supply of it, and the government doesn't have a monopoly on the possession of gold and silver, the use of gold and silver. It can't print gold and silver. It's an item. If it wants to issue bank notes and spend money that way, it's limited by the amount of gold and silver that is physically in its possession. So it's always been a great check on government spending, and that's why governments around the world for the past 100 years have done everything they can to demonetize gold and silver, keep people from being able to use because they don't want gold and silver to be money because it limits their power. Mike Gleason: You obviously had first-hand knowledge of what our politicians know about these subjects and what they think about our whole Federal Reserve System. I'm curious, how do they see it? You know, I get the sense that at first Dr. Paul was truly a lone voice in the wilderness when it comes to advocating for sound money, but we're seeing a few others in D.C. who share the same concerns about the direction that things are going with our nation's monetary policy. What is your sense of the current situation? Paul-Martin Foss: Well, I think you have basically two groups of politicians, well maybe 3 groups of politicians when it comes to the Federal Reserve and monetary issues. You have the people who are kind of fatalistic. I remember Dr. Paul was talking, he was grilling Bernanke at one of his semi-annual hearings, and I stepped back in the anteroom and heard a senior staffer say, “well you know, Dr. Paul's probably right about this, but what can we do? We're so heavily invested in the system we're in.” So they see it as basically an unchangeable system. It's just going to run its course. That's one group. You have another group of people who obviously are the ones who benefit from the Federal Reserve and from the banking system. They're the ones who get the campaign contributions from Goldman Sachs, from Bank of America, from Citigroup, etc. And then you have a third group, and I'd say this is probably the largest group, is the guys who just get in there and they're completely in over their heads. They have no clue what's going on, and they just (say), “well the Federal Reserve is here and it's not going to change, but I don't know enough to take a position either way” and they just they don't want to open their mouths and say anything about the Fed even if they have an inkling that something's wrong with it because they're afraid that they'll make a mistake and Paul Krugman or some other liberal economist will jump down their throats and make them look like a fool, so they just keep their mouths shut and the system just keeps on rolling along. Mike Gleason: Where do we stand with the Audit the Fed bill at this point? I know it had passed the House but failed to obtain the 60 votes necessary to break the Senate filibuster late last year. Ron's son, Senator Rand Paul, voiced an unbelievable amount of frustration over the fact that the Fed officials themselves were openly lobbying against the bill so they can maintain their secrecy, making the claim that it's just necessary for them to have no transparency or accountability in order to do their job effectively. So where do things stand on the drive to audit the Fed, and how important is this legislation in terms of truly reining in the Federal Reserve? Paul-Martin Foss: Well, the Audit the Fed legislation it's the first step towards reining in the Federal Reserve, it won't do anything in and of itself necessarily. What we want to do basically is just blow the doors open on the system and let Congress and let the American people know what exactly the Fed is up to. What are they buying, what is backing their mortgage-backed securities? I mean, they have nearly 2 trillion dollars in mortgage-backed securities. What's backing that up? Are those performing loans or non-performing loans? Especially when you're starting to get now to where people are talking about helicopter money and purchases of corporate debt and purchases of ETFs, the Fed could get involved in a whole bunch of other markets, and Congress needs to know what the Fed is up to. So it's a very important bill. I remember when these audit restrictions were first being discussed in the late '70s. Obviously this was before my time, but looking at the testimony, GAO (the U.S. Government Accountability Office) themselves said that they could not adequately audit the Fed if they had no access to monetary policy operations because that was the largest dollar amount of the Fed's activity. And here we are 40 years later, and GAO still is not allowed to access those and see what's going on, so it's a very important bill. Yeah, the roadblock really is the Senate. That's the problem, it's been a problem for years and years. It was always a problem when we were in the House. Even the Democrats when they were in the majority and Barney Frank wanted to push all his legislation, he always complained about the Democratic Senate, that they would never pass anything. It seems like they're hardly ever doing any business. They're not passing bills. They just don't want anything that passes the House to come through. So the bill gets a tremendous amount of House support. When we first introduced it, it had 320 co-sponsors. It's just an incredibly popular bill on the House side, and the Senate side, you know, Senate leadership is just not going, they are essentially doing the Fed's bidding, and I don't think under this House leadership that the prospects for it passing the Senate are particularly good unfortunately. Mike Gleason: Speaking of that, the banking lobby is probably the most powerful special interest group out there. The banksters really seem to have a lot of the politicians in their hip pockets. We often see political officials leaving D.C. and heading to Wall Street to work for these banks or "consult" for them, so given all of this cronyism, is there any chance to expect meaningful reform, and what should that reform look like in your view? Paul-Martin Foss: Well, I think meaningful banking reform is going to have to be a complete bottom up overhaul. The national banking system in the U.S. was created in the 1860s for the purpose of funding and fighting the Civil War, and it's essentially just an old patchwork of regulation that been added on top of that, and every time there's a financial crisis… in the Depression, you had Glass-Steagall patched onto it, and then you had all these, you've had Dodd-Frank now and Sarbanes-Oxley, and all these pieces of legislation that just get kind of patched on to this 150 year old system, it's a very rickety system. The banks, they receive government subsidies through deposit insurance with their line of credit at the Treasury Department. That is a huge subsidy for their operations. There are high barriers to entry, so smaller banks and financial technology firms and financial services firms have a hard time breaking into the industry, which helps the entrenched Wall Street banks. The whole Federal Reserve System was designed and created to ensure that New York maintained its position of prominence and power within the financial system. So there's just so much institutional weight against any sort of reform effort that I'm very discouraged that there will be any substantive reform in the near future. It may very well have to be that the banking system will completely collapse before somebody gets serious about reforming and replacing things. Mike Gleason: In the wake of 2008, there was massive fraud all the way up to the top of the banks. We had fraud in loan underwriting. The derivative market fraud was incredibly pervasive. These prop trading desks at the big banks were illegally operating and colluding together, and we would read something like they'd be profitable like 199 out of 200 days or something like that. Is there any chance that the public outrage over this is going to reach a point where the elected officials will be forced to do something should it happen again, or, and not to take a fatalistic view here, will these guys be able to operate without any accountability forever? Paul-Martin Foss: Well I think there possibly could be some great public anger if something like this happens again, but I was honestly discouraged by the '08 financial crisis because I remember the bailouts. We were using still an email system where we printed out emails on paper to assign them, letters to respond to constituents and non-constituents. I had a stack of papers probably about 5 feet high sitting on my desk from people who were opposed to the bailouts, and every other office was the same. I heard some of these Senate offices were getting 100,000 phone calls in a week. People were horrendously pissed at the bank bailouts, but then a month and a half later at the elections, only one Congressman who voted for the bailout lost his seat. People can be very mad, but they have to maintain that anger for a long period of time. The Tea Party kind of had the twin issues of the bailouts – anti-bailout and anti-Obamacare – that kind of caused that movement to form. But people are really going to have to pay attention to these issues and pay attention to them for months and months, and maintain that anger in order for them to be able to put enough pressure on their congressman to actually get something changed. Mike Gleason: We talked earlier a little bit about the purpose of inflation, but generally speaking, why is deflation viewed as such a negative thing by Keynesians, because this is really one of the main differences between Austrian economists and the Keynesians, although there are many more, but the idea that the cost of things going up is somehow beneficial to the economy has always been a curious one to me. Why do they believe this? For some reason, they think that when prices go down, people will stop buying, which is not the case. When gold goes down, it's a buying opportunity. When silver goes down, it's a buying opportunity. If somebody has a sale, 25% off or 50% off, people start coming into stores and they start buying. That's Sales 101. The Keynesians for some reason tend to think that these things that are true at the micro level are not true at the macro level, and their entire public policy response is based on this bogus notion that falling prices are a bad thing and will lead to a drop-off in consumption, and then kind of a self-fulfilling spiral of lack of consumption feeds lack of production, etc. And it's theoretically unsound, it's practically unsound, but it's been disproven in experience, but they still continue to cling to it. And that's why they pursue their inflationary policies as a response to every single economic downturn. Mike Gleason: At some point, their inflation target of 2% you have to think is just going to sort of get away from them, and all of a sudden we're going to have maybe hyperinflation, maybe not, but certainly we've seen our dollar lose an unbelievable amount of value, I believe 98 cents on the dollar from the 1913 dollar when the Federal Reserve was originally created. Paul-Martin Foss: Yeah, and they're talking about overshooting on inflation. They said, well maybe 3 or 4% isn't bad, maybe 5 or 6% for a short amount of time. When you start talking about that, then definitely they stand a chance of losing control. Mike Gleason: We're now seeing negative interest rates in Europe, which is just a tremendous punishment to savers, and maybe we'll see negative interest rates here in the U.S. as well. So the war on cash is ratcheting up, and that's a topic we've talked a lot about here. There's a concerted effort out there from the central planners to demonize cash holders and paint them as terrorists or criminals and so forth. All of this seems to be an attempt to perhaps bring about a cashless society and thus better regulate and track the citizens and all of our money. Talk about the war on cash movement and how damaging this is to the idea of liberty. Paul-Martin Foss: Yeah, the war on cash… the major driver or the supposed driver, the kind of bogeyman they like to pull out of the closet is, “oh if we eliminate cash or reduce cash payments, then it'll make it far more difficult for terrorists and drug dealers and human traffickers, etc. to operate, so we have to get rid of cash to ensure that we can crack down on these types of activities,” and it's completely bogus. Even if you tried to get rid of cash, these people are going to find ways to do what they want to do. They're going to find alternatives. The only person who is going to suffer is the average man and woman who just wants to go down the street and pay for 20 bucks' worth of stuff with a 20 dollar bill or go to yard sales and estate sales on the weekend and pay with cash. It's all about governments wanting to get tax money and wanting to maintain control over the populace. I think Europe is probably a little farther advanced than we are. They're starting to get rid of the 500 Euro note. It's probably only a matter of time before they get rid of the 200 Euro note. Who knows, maybe the 100 Euro note will go by the boards. You've got this discussion of getting rid of hundred dollar bills in the U.S. There's just not enough opposition and not enough attention being paid by people in the United States to the war on cash and how it's going to affect them, and I'm afraid that unless there's a strong resistance to this, we're going to get railroaded and most people won't wake up until it's too late. Mike Gleason: We certainly believe precious metals ownership is an excellent way to protect yourself against the war on cash as it's essentially an off-the-grid way to store your wealth and gives you some independence from the banks. What are your thoughts there and how might folks fight against this initiative by the central planners to track all of our money and make it digital? 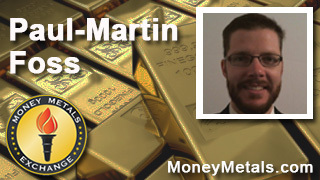 Paul-Martin Foss: Yeah, I certainly advocate people holding gold and silver. I own gold and silver. I try to use as much cash as I can now. Credit cards are convenient. You have to give them that, but there's just sometimes where you want to use cash just to kind of stick it to the system, I guess. A lot of people need to hold alternative assets. The problem is a lot of people put their assets in a bank account or in investment accounts, mutual fund accounts, etc., and it's like they say, possession is 9/10ths of the law or a bird in the hand is worth two in the bush. If you don't actually have physical possession of the gold and silver that you own, if you don't actually have physical possession of cash, you don't really own it. I think you need to always have some cash at home and gold and silver. Mike Gleason: Well, as we begin to close here, Paul-Martin, what is your biggest fear for the U.S. and the global economy as well if things continue down this road... one paved with massive inflation, money printing, and completely out of control debt? What are we headed for if we don't find some sound money religion here? Paul-Martin Foss: Well, my biggest fear is that we're going to first head towards hyperinflation. I don't trust the central banks that they know what they're doing. I think they're grasping at straws. I think they will probably make a horrendous mistake that is entirely predictable and that will destroy the monetary system in this country, or it may not even be the Federal Reserve that starts it. It may be the European Central Bank or some foreign central bank that starts things, and everything, other central banks respond, and it becomes kind of a worldwide contagion. That is my biggest fear, but then as it relates to a cashless society and the war on cash, my big fear there too is that eventually people will be forced into the banking system. People who don't want to have bank accounts are going to be forced to have them so the government can force them then to purchase health insurance or force them to purchase whatever the government thinks they need to, and they can just garnish their accounts whenever they want to for tax purposes. And people just need to be made aware that that is the ultimate end goal, so that they can take steps to resist it. Mike Gleason: Yeah, education is certainly key. We need to have more people informed about these issues and what's going on. Certainly your organization there is a big part of that. Well, Paul-Martin, I really want to thank you for your insights, and thanks for the work that you're doing there at The Carl Menger Center and for working to spread the ideals and concepts of liberty, free markets, and sound money. We hope we can visit with you again as things unfold, and hope you have a great weekend. Paul-Martin Foss: All right, sounds good. Hope you have a good weekend too. Mike Gleason: Well that will do it for this week. Thanks again to Paul-Martin Foss, founder and president of The Carl Menger Center for the Study of Money and Banking, and former legislative assistant for Congressman Ron Paul. For more information, please visit MengerCenter.org, and you can also find Paul-Martin's wonderful commentaries on sites such as VoicesOfLiberty.com, Mises.org and LewRockwell.com among others, and you can also follow him on Twitter @PMFoss. Be sure to check that out. Check back next Friday for our next Weekly Market Wrap Podcast. Until then, this has been Mike Gleason with Money Metals Exchange. Thanks for listening and have a great weekend everybody.